One of the classes I loved and now remember best from my college days was about world religions. We read The World's Religions by Huston Smith. I was electrified by this book. The diversity of all the different faiths in the world was vast. Yet, there was a connectivity between them and a richness in each of them that I sensed, yet couldn't articulate. This class sparked a life-long interest in religion and spirituality that I haven't even begun to quench. The more I learn, the more I realize how little I know. But, I do believe that when you look closely, you can see that there is more that unites all religions than separates them. 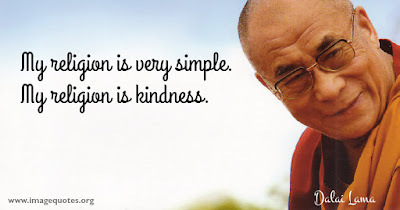 I adore this quote by the Dalai Lama. And, I do believe that kindness is the common thread coursing through all the religions of this world. 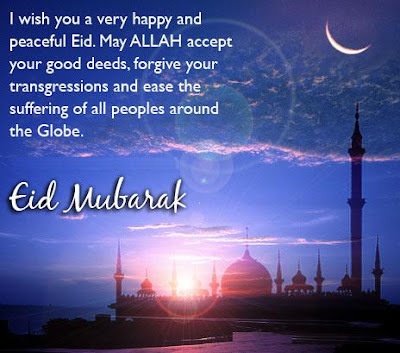 Today's post is dedicated to the religion of Islam, because today is Eid al-Fitr, "an important religious holiday celebrated by Muslims worldwide that marks the end of Ramadan, the Islamic holy month of fasting". According to the Pew Research Center, there were 1.6 billion Muslims world-wide in 2010-23% of the global population. Islam is currently the fastest growing major religion in the world. In the United States, there are 1.8 million Muslim adults (and 2.75 million Muslims of all ages) in the country. This survey also found that a majority of U.S. Muslims (63%) are immigrants. Most important to me, however, are my personal stats. The fact that there is a large number of Muslims in my community and the fact that the majority of the class I walk into every day is full of students who are Muslims. I also have several colleagues and now friends who are Muslims. This drives me to want to know more, to understand better. The more we know, the more we understand, the better we connect. The first time I personally knew someone who was a practicing Muslim was when I taught ESL at a family literacy program. It was the year 2000 when Ramadan occurred around the same time as Christmas. Many of the women in my class were fasting. I noticed that they seemed tired, but strangely peaceful and calm. At first, I saw only deprivation and sacrifice, but then I saw something much bigger and expansive. One women in particular caught my attention-Zainab from Djibouti. She was a lovely woman, but during this time, she seemed to posses an almost ethereal sense of cam. She seemed to have a peacefulness , a sacrifice born of quiet strength, a real beauty. I asked a lot of questions of my students during this first brush of mine with the Islamic faith and they generously told me about themselves and their religion. "I want to know you" are some of the most powerful words you can say to someone. My knowledge of Islam increased about a thimble-full that year. I listened and I learned. I still didn't know much about Islam but I was moving towards knowing more. And, every time we learn one small thing about each other, we grow closer. The knowing allows our compassion to flourish, our hearts to crack open a little more. Fast forward to this year of 2016. I'm working with middle-school students, an age when many fast for the first time during Ramadan. My colleagues let me know that Ramadan will begin on June 5, so there will be one week of school left. We make important accommodations, like planning our huge picnic before this so everyone can enjoy the food. So can you drink water during the day? But then you wouldn't be fasting. Okay, so you CAN'T drink water. Well, you CAN but then it isn't fasting. If she wasn't such a lovely and generous soul, she would have said something like, "Look, dummy, everyone has free will but fasting is fasting." Anything that is really worth doing is going to cost you. This is something I heard Martin Sheen (the actor and activist) say in an interview. Many of the kids are fasting during Ramadan for the first time in their lives. At first, it kind of worries me. But, then I see that a lot of them have an excitement about it, a sense of joy, and I find it really moving. One girl in particular, I really notice. There's something sparkling about her- her eyes were shining when she told me she's fasting. She said her dad told her she didn't have to do it. She said she told him, "I want to try." I can see that it's hard for the kids and it truly moves me that these twelve and thirteen-year-olds have such devotion and faith, that they can do this. I watch and observe them. I ask how they're feeling. The same girl from above is really struggling on the first day and my partner asks her if she got up before the sun rose to eat. She says no- that she was too tired. My colleague strongly advises her to get up and eat with her parents, even if it's hard, because it will make the rest of the day easier. Upon hearing this, I ask more of my "Ramadan for Dummies" questions. I'm assuming that maybe people just roll over at 4:oo in the morning, have an energy bar with 500 calories, and go back to sleep. NOOOOOOOO, counters my patient teacher. The majority of people will get up at 3:00 and prepare and have a proper feast. Wow- just wow. My admiration for the strength and devotion in the faith grows. On that first day of Ramadan, two of our bilingual specialists come to help in the classroom. Happy Ramadan, I say to N. How are you doing? I feel great, she tells me, and she looks great. And happy. And peaceful. And, she's not a bit crabby or tired, and she's as lovely as ever when she interacts with me and the children. Happy Ramadan, I say to my other colleague. How are you doing? He says, I'm fine except the no coffee is killing me. And, then he rubbed his forehead as if to indicate a caffeine-withdrawal headache. Being a person who is deadly serious about her coffee, I felt a wave of compassion rush over me. After this wave passes, I glance longingly at the thermos of coffee that holds the delicious french roast that I was planning to have while we work in math groups. I quickly decide that would be cruel and inhuman to drink that, not only because of my colleague but because of all of my students. During the entire month of Ramadan, Muslims fast every day from the crack of dawn to sunset. It is meant to be a time of spiritual discipline - of deep contemplation of one's relationship with God, extra prayer, increased charity and generosity, and intense study of the Quran. In simpler words, Ramadan is akin to pressing the spiritual "reset button." But if that makes it sound super serious and boring, it's really not. It's a time of celebration and joy, to be spent with loved ones. At the end of Ramadan there is a big three-day celebration called Eid al-Fitr, or "the Festival of the Breaking of the Fast." It's kind of like the Muslim version of Christmas, in the sense that it's a religious holiday where everyone comes together for big meals with family and friends, exchanging presents, and generally having a lovely time. Despite the hardship of fasting for a whole month, most Muslims (myself included) actually look forward to Ramadan and are a little sad when it's over. There's just something really special about knowing that over a billion of your fellow Muslims around the world are experiencing the same hunger pangs, dry mouth, and dizzy spells that you are, and that we're all in it together. The Arabic word for this community- be it on a global, national or local scale- is ummah. In today's world, it is more important than ever that we know and love our Muslim neighbors. We need to remember our common humanity and focus on what connects us more than what divides us. In an age, where a presidential nominee is calling for a blanket ban of all Muslims into our country, we must not let the actions of a few scare us into marginalizing a whole group of human beings. In an age, where hate crimes against Muslims are on the rise in the U.S. and my state, we must be the ones who say: No. This is not acceptable. These are my brothers and sisters. In an age, where it may be tempting to harden our hearts out of fear, we must seek to understand. I am convinced that the more we know each other, the less fear we will have, the more understanding and compassion we will have. Let me end by quoting two different spiritual powerhouses- Father Greg Boyle, a Catholic Jesuit priest and Rumi, a 13th century Persian poet and Islamic scholar. Mother Teresa diagnosed the world's ills in this way: We've just "forgotten that we belong to each other". Kinship is when we refuse to let that happen. With kinship as the goal, other essential things fall into place; without it no justice, no peace. I suspect that were kinship our goal, we would no longer be promoting justice- we would be celebrating it. On this day of Eid al fitr, my greatest wish for the non-Muslims of the world, is for us to tear down these barriers, these walls, and let understanding, knowledge, respect, and love come into our hearts. On that first day of Ramadan, I drank my 10:30 cup of coffee at 3:00 when all the students were gone and I was alone in my classroom. I never told my colleague that I didn't drink coffee because of him. I sipped my coffee, thought of him (still fasting for several more hours) and I felt a connection. A connection-a kinship- a lowering of barriers-the beginning of everything. If you want to listen to a great collection of stories about Ramadan and the diversity of Muslim voices and experiences, I highly recommend this recent show from On Being.